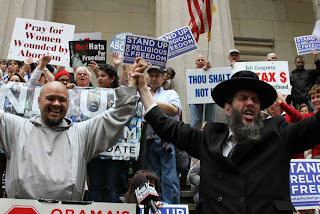 Immediate Release: Dr. Fallwell don't kosher Homosexualist Romney the great "mittagator" | RabbiLevin.com - Fighting for Morality! Immediate Release: Dr. Fallwell don't kosher Homosexualist Romney the great "mittagator"
Beware! Danger! Wolf in Sheep’s Clothing! Q: Why does Romney think his latest flip flop/midnight “conversion”/pandering to the religious right to now “oppose” civil unions-“mittigates” a 15 year record of supporting the gamut of the radical homosexual agenda? Does he take religious people for fools-“the Great Mittigator”? ​Although we are not acquainted, I knew, visited and worked with your father. In around 1987, he requested my approbation, which appears on the bookjacket of his prolife tome, “If I Should Die Before I Wake”. ​Thus I am deeply saddened by your inviting the dangerous homosexualist Mitt Romney to address thousands of your deeply religious students at their most special graduation day. Since it is on Sabbath, I can’t attend personally so I’ve prepared a video-an alternative Torah values commencement address-for you, your students and guests. I hope you will honor the Torah values of my community, the work I did with your father over the years(i.e. we sat together in Alabama to support Ten Commandments Judge Roy Moore, for over 30 years I addressed the Annual March for Life, etc.) and your father’s memory, by viewing this video and encouraging the graduates to see it (perhaps you can show it!) so they will be educated as to both Romney’s true pro-radical homosexual agenda/record as well as to understand our current moral situation. ​How shocking it is that in contrast to your great father, who founded the Moral Majority in ’79 and would have surely been on the side of the majority of Carolinians and courageous Colorado lawmakers who rejected even homosexual unions, you and many other conservative and religious leaders allow yourselves to be used by homosexualist Romney to gain access to the purest amongst our society; the Remnant. ​Dr. Fallwell, before you, Dr. Land, Rev. Pat Roberston and too many others capitulated/surrendered and agreed to donate your names, your reputation and your millions of faithful followers to the Romney campaign, did you check the massresistance.com website or read the 600 page annotated book, The Romney Deception, by Amy Contrada, which catalogues one and a half decades of unceasing dedication by Mitt Romney to all aspects of the radical homosexual agenda? ​From his letter “pledge” to outdo Senator Ted Kennedy in his fealty to all things homosexual, to his Homosexual Youth Pride Proclamations, to his support of open homosexuals/homosexuality in the military and his support of de facto homosexual marriage(civil unions) (until today, May 9, when the Great “Mittigator” performs his latest flip flop!) What about his forcing Catholic Charities to place children with homosexual couples, threatening clerks if they wouldn’t perform “marriages”, his supporting homosexual Scoutmasters and boosting the budget for homosexual bi- and transgendered school curricula beginning in Kindergarten. Is Romney renouncing this whole list, or are all these things “kosher”? Do you give the “Mittigator” a pass? ​Governor Romney could have legally/constitutionally ignored the court’s powergrab and fought against the imposition of marriage but he kept his promise, consistently betrayed his own religion and is now on the precipice of duping your innocent graduates and many millions of the religious Remnant. ​Dr. Jerry Fallwell founded the Moral Majority but now we are truly a leaderless Remnant – under onslaught by the moral Darwinists. We have in 3 decades morphed into a moral minority! ​Dr. Fallwell, you and the Evangelical leadership are now G-d’s men of the hour. Will you disappoint Him and compromise on the severity of adultery? Surely not! So, why compromise on the radical homosexual agenda? We are spiritually at the tipping point. History will surely record your response!
) I call upon you to preach purity to power on May 12. Distribute a full record of Romney’s homosexual agenda including his boasting on Jan. 8, 2012, of appointing open homosexuals (meaning activists) to the Massachussetts Courts and his Cabinet and his pledge to continue to do so.
) Speak up for specific G-dly values on May 12. Reject the Romney agenda.
) Go to Rabbilevin.com, let your students and followers see the unvarnished truth.
) Christians and Jews were once thrown in the lion’s den, can we no longer sacrifice for Him. Let us not compromise with the false concept of “the lesser of the two evils”. ​A wolf in sheep’s clothing who pacifies the Remnant and continues to promote even a ¾ evil agenda with no more loyal Conservative Republican opposition in Congress is more dangerous than Obama with a Congressional loyal opposition. Please e-mail this to your e-mail list! Thank you, Rabbi Levin, for standing firm for the Truth of the Bible. It is disgraceful when a spiritual leader endorses a liberal/ungodly politician in the cause of pragmatism and politics. ...it is tantamount to taking the Holy Name of G-D in vain... or bearing false witness. True worship, obedience to G-D's Word and love of God and other people, leads to the best chance for a life of health, prosperity, peace, freedom, and joy. Scripture is the Sword of the Lord that will defeat the evil enemies of G-D. (Isaiah 31:8-9) When Israel departed from the Law, Assyria/Babylon always rose up as G-D's rod of discipline to take them captive. (Isaiah 10:5). It is always when the beauty and treasure of the Word/Law/Book of the LORD is rediscovered, and hearts are circumcised again, when repentance, return and restoration/rest have taken place, that Israel, G-D's people, are set free again.